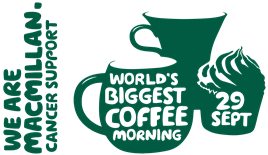 Come along to the Sir Duncan Rice Library on Friday September 29 to be part of Macmillan’s World’s Biggest Coffee Morning. Library staff will be busy baking next week to offer hungry students and visitors the chance to eat cake AND raise money for a very worthwhile cause. The coffee morning will be on the ground floor of the Sir Duncan Rice Library between 10am and 12 noon. We hope to see you there with your pennies ready.